Sometimes it's as simple as a head swap to get the right look you want. Other times, it can be building a whole new model from parts. Either way, getting the right "feel" or look to your model is something we all strive for on one level or another. This week, I grabbed these pics from Warhammer in Progress. 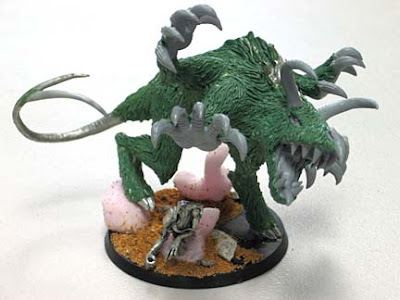 It comes from a previous post where he's showcasing his Nurgle models that double in use for his Daemon force as well. These guys speak to me as conversions. I think they look great. 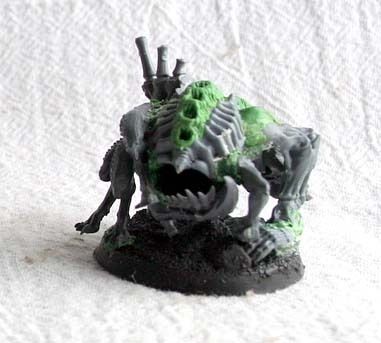 They capture the feel of a Nurgle type spawn creature. Something you know is daemonic, something you can't tell what parts are what or where the mouth and eyes are... and you hope you can put enough bullets into it before it reaches your lines. I've always been jealous of folks who can do this kind of work. Ork players are up there too. Those guys come up with some of the best conversions around as well. My friend has some amazing looking Ork battlewagons. 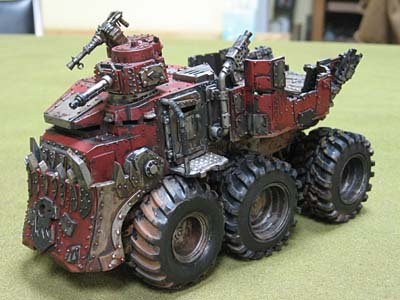 Sure, they do the same thing as a regular battlewagon that's not converted at all, but they add so much more to the look of the force after his conversion work. They give the army a certain feel to it. Next time you get a chance, take a minute and try to capture the "feel" of your force with your conversion work. It doesn't have to be big or involved to be successful, you just have to give it try. that Ork truck is simply brilliant. simplicity itself to achieve, but all the better for it. i'd love to know where those wheels are from. the problem is of course, 'feeling right' is subjective. While i might think my conversions are amazing, someone else may (and probably will) disagree. whether this is down to innate ability in some people to see what works and a lack thereof with others, or whether it is simple personal taste, is a subject fraught with pitfalls and leading to potentially insulting territory, so i'll leave it there. on this subject though, if anyone fancies taking a look at some of the work i have completed most recently (a few months back, but recent for slow old me) and telling me if they think it 'feels right' i'd be very interested (and not at all insulted if you think it doesn't). I specially like the spawns. Anyway, I call up to more individuality among the armies and would like to see the owners invest more time in unique conversions. Those spawns look way better than the standard ones from GW. Ron, I'm sorta forced to do conversions and kit bashes now and again, partly due to lack of funds. The other part being I really like having something on the table that no one else has. Feel is very important to me. It's gotta look right, even though I typically have no idea what "right" is until I'm near finished. I have scrapped 2 weeks of converting because the feel just wasn't right. Though, as Atreides said, "feel" is subjective, it's been my experience that if the feel is correct from the builders POV other folks will pick up on that 99 times out of 100. I'm just the opposite of Atreides, if it sits too long I lose the Zen of it and it will likely never get finished. I did a simple head swop and a few skulls instead of Ultramarine symbols to make my Marneus (Relicgar) Calgar more Relictors-like. I think it worked. I think a few odd swops here and there is the way to make your Army unique and 'yours'. In my case, chaos bits and pieces, the odd spike or chain and voila... Relictors. I could not agree more with Atreides more, I believe some of my best work are the models I have given up on, or let sit on the shelf for months at a time. Only to come back to them with a new focus or direction. I am a firm believer that if you don't like the way something is looking, break it off an start over. Or take some time off, and work on something else. I don't mind spending months on a conversion just as long as I am happy with the end product. I would like to thank From the Warp for featuring my Spawn. It is sites like these that got me thinking more creatively, and encouraged me to start my own blog. I am quite new to the whole conversion scene myself but it is starting to dawn on me how much more interesting and rewarding it is to spend some time and thought on a model. I usually just bash them together with a few FW or other such bits but, they really come alive when you start to add little details. I'm currently converting a character model for a customers Salamander commission, he has evolved so much from my initial thoughts on him as to be unreconizable!